The Universe is an incredible place that defies belief. We take it for granted because the distances and scale is so alien to our little tiny pale blue dot that our brains can't even process them. Maybe that's why Italian artist St. Tesla turns galaxies and nebulae into tiny precious jewels. "Macrocosm and microcosm is an ancient Greek Neo-Platonic schema of seeing the same patterns reproduced in all levels of the cosmos, from the largest scale (macrocosm or universe-level) all the way down to the smallest scale (microcosm or sub-sub-atomic or even metaphysical-level). In the system the midpoint is Man, who summarizes thecosmos." I was doing some researches and I found experiment with miniatures of space with tilt shift so I decided to try my own. 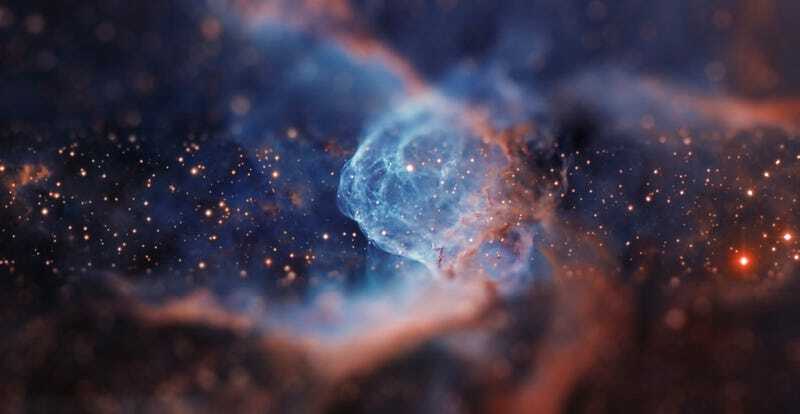 The result has been nebulae, galaxies and supernovae transformed into microorganism. St. Tesla is an Italian cross-disciplinary artist and director. Her current interests are focused about merging science (mostly biology and neuroscience), art and systems of thought, on dystopian narrative, and aesthetics of the internet in attempt to penetrate different existing ecosystems. You can follow her work on Béhance, Twitter, Flickr, and Vimeo.